is a native of Chicago, Illinois. He attended University of Chicago for his undergraduate studies. Dr. Solus earned his medical degree from Johns Hopkins University School of Medicine. He performed his anatomic pathology residency at Massachusetts General Hospital, the largest teaching hospital of Harvard Medical School. 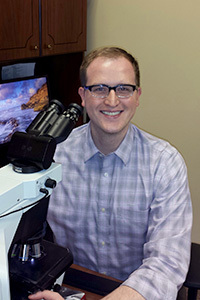 Dr. Solus completed a dermatopathology fellowship at Washington University in St. Louis, Missouri. In addition to his commitment to education, Dr. Solus has dedicated years to helping others through multiple community service organizations, including mentoring programs, animal shelters and student-run clinics. Dr. Solus enjoys sharing his passion for dermatopathology through teaching dermatology residents and physician assistants. Dr. Solus also enjoys exploring new restaurants and traveling with his wife.